Come see us perform at the third annual Multicultural Festival, we'll be on stage from 12:30-1PM. 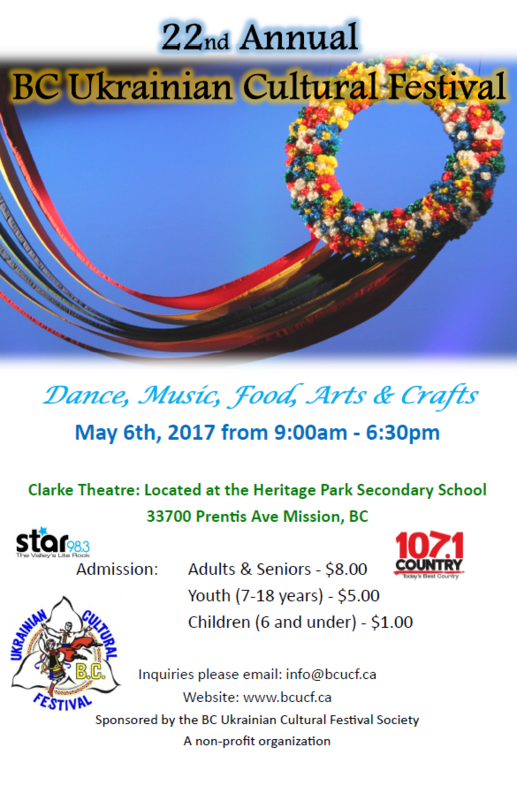 From traditional performances to cultural arts, live music, games, delicious food, and so much more, it's a celebration you won't want to miss! For more information about the festival and other performances and activities click here. There's nothing better than fresh homemade goodies during the holidays - especially when your purchase helps a child pursue their passion. All our items are carefully baked, packaged, and sold by our dedicated dancers. The bake sale begins November first - and all orders must be placed by November 30. For more information click here, and to order contact us today! Come and immerse yourself in Ukrainian culture at BC’s largest Ukrainian Festival. Watch dance teams compete for trophies, eat delicious homemade Ukrainian food, and explore the many vendors offering Ukrainian merchandise, art, and much more! For more information click here or visit their website.